What do you do when you’re wrongfully accused of carrying out the worst terrorist attack in human history? 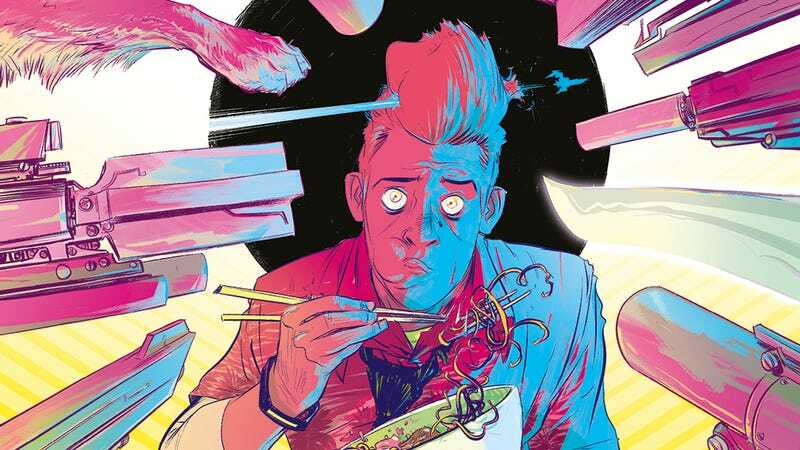 Nathan Bright has the misfortune of finding out firsthand in The Weatherman, a new Image Comics sci-fi action series by writer Jody LeHeup, artist Nathan Fox, and colorist Dave Stewart that follows the No. 1 weatherman on a terraformed Mars as he tries to survive the greatest manhunt the galaxy has ever seen. It’s a much more serious action story for LeHeup after last year’s irreverent Shirtless Bear-Fighter, and Fox and Stewart bring a heightened level of intensity and drama that makes Nathan Bright’s plight all the more harrowing. “From an aesthetic standpoint, the inspiration comes from a lifetime of being an avid consumer of story and genre fiction in the form of comics, anime, film, television, etc., colliding with the creative energy I had after leaving the world of work-for-hire editing,” says LeHeup. “Sitting down to finally write my own stories it was like my brain had been let off a leash and The Weatherman just exploded out of me. Nathan’s art was a big inspiration for me as well and continues to be.